Fourteen British artists were commissioned for Small Acts at the Millennium to create a series of works marking the personal and political resonances of the Millennium and the charged questions it raised. Against a backdrop of global corporate pageantry, they created a series of actions and site-specific works across the year that were dissident and personal, exploring issues such as individual and community histories, memory, anonymity, mental health, public space, disability, rumours and hitchhiking. Artists included: Graeme Miller, Bobby Baker, Mike Pearson, Kira O’Reilly, Brian Catling, cris cheek and Kirsten Lavers. Small Acts at the Millennium was curated by Tim Etchells, Lois Keidan and Adrian Heathfield, and was financially assisted by the Arts Council of England and the Millennium Commission. For a full listing of the Small Acts works please click here to browse the leaflet designed by Jennie Smith. 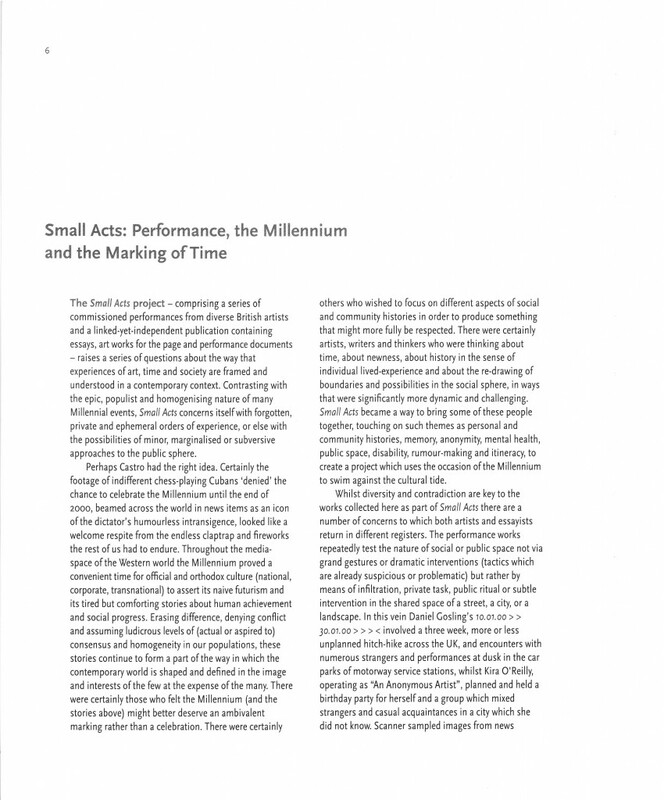 This visually arresting book brings together documentation of all of the Small Acts works with a dynamic series of essays on the millennium and performance, combining cultural commentary with fiction, art criticism and philosophy. These writings, like the works they complement, contest the stories that contemporary culture tells itself about time. 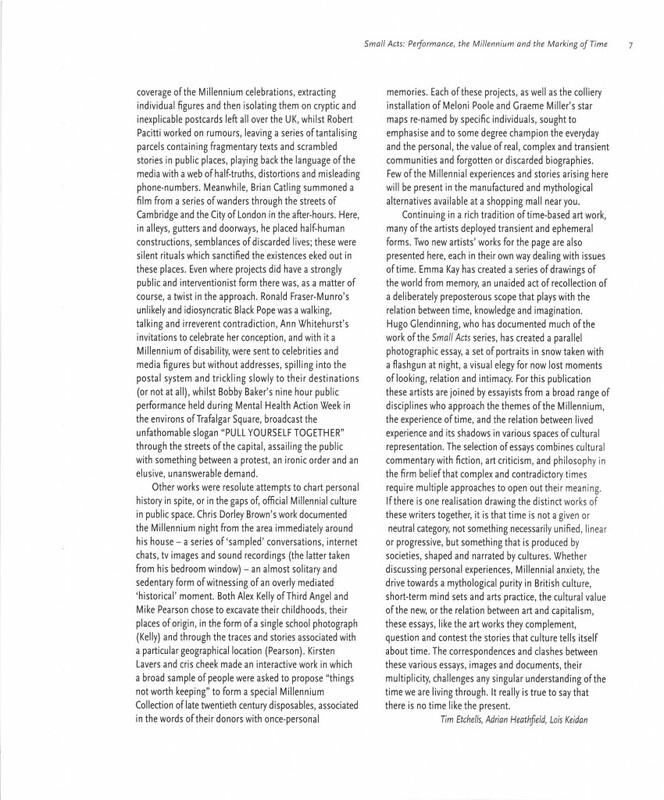 Contributors include: Brian Eno, Peggy Phelan, Tim Etchells, Gilane Tawadros, Alexander Garcia Duttmann, Emma Kay, Lois Keidan, Deborah Levy and Suzanne Moore. Homepage image: Brian Catling, Small Act at the Millennium, 2000. Photo: Hugo Glendinning. © the artist. 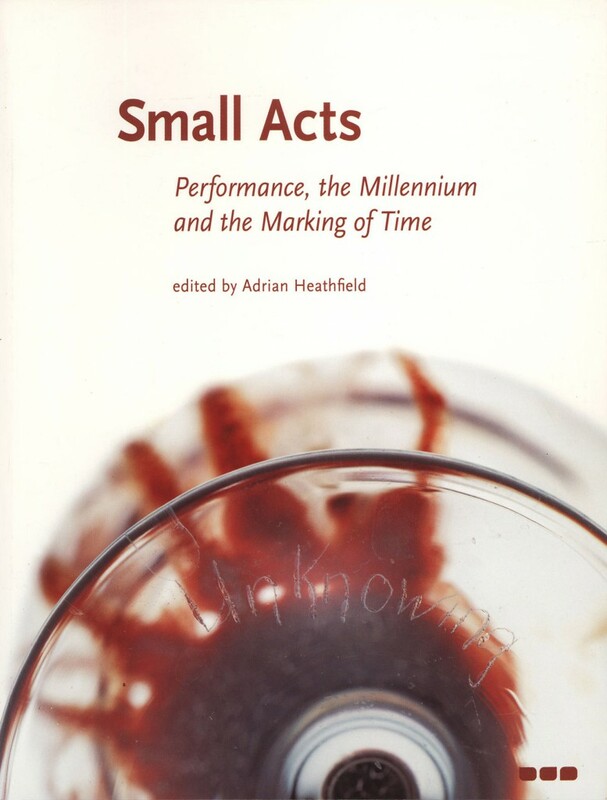 Small Acts: Performance, the Millennium, and the Marking of Time, Black Dog Publishing, London, 2000.